Creating "Show Stopping" industry standards in every market we serve has led to our 36 year award winning run. Never having to paint lockers again. Increasing your efficiency is possible due to Remcon's ability to create customized pallet solutions at a reasonable cost. While competitive bins tend to crack and break within a few years, it is not unusual for Remcon bins to last 10, 15, or even 20 years. Our bins save you money over the long-term. See how Remcon customer, Jack Foulke, saves money with Remcon bins and how you can, too. Long-lasting Remcon products save you money, and they can be customized to meet your exact needs. Our friendly, dependable people care about making your purchasing experience easy and enjoyable. Learn more about All-American Durability and the benefits of working with Remcon. This FDA-compliant, premium polyethylene, flat-bottom bin with replaceable pallet includes our exclusively-designed “R” lip with its rounded edges to resist cracking. 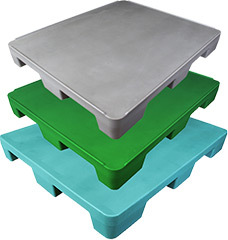 Our most popular and the best value bin in our easy to clean, long-lasting, replaceable pallet FBP Series.